Thousands of people will be taking to the streets of Oxford for the start of the Christmas Light Festival tonight. 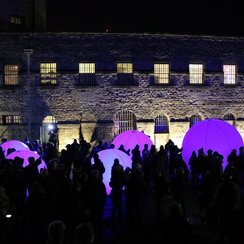 The lantern procession on Friday night started at the castle, before weaving through the City Centre to Broad Street. Schoolchildren from across Oxford have been taking part among the crowds. We've got a full list of road closures below and there's more information and Click Here for more information from the official website. Broad Street will be closed and all parking suspended from 08:00 Friday 25th to 23:59 Sunday 27th November. Access will be maintained to Turl Street / Market Street / The Covered Market / Ship Street on Friday 25th November 08:00 to 16:00. Saturday 26th November 00:01 to Sunday 27th November 23:59 all traffic will exit Turl Street onto the High Street. There will be 6 loading bays on the corner of Turl Street on Saturday 26th and Sunday 27th November. Market stalls will be built Saturday 26th November from 06:00 to 08:00. There will be no additional road closures. Buses will operate as normal,For more information please visit www.oxford.gov.uk/christmas and click on ‘travel info’.